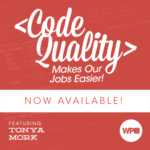 Tonya is a software and electrical engineer, developer educator, and complexity translator. With over 3 decades of high-tech, enterprise engineering experience, she’s on a mission to develop professional WordPress developers and engineers at Know the Code. Her focus is unlocking your potential and empowering you to grow, excel, innovate, and prosper.